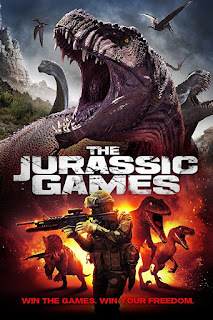 Set in the near future, fuelled by the popularity of reality TV and game shows, THE JURASSIC GAMES pits ten death row inmates against each other in a life or death VR gameshow. It requires them to complete four stages; the winner gets a full pardon and is released, the losers get their lethal injection a bit earlier then planned. Not only do they need to complete all the stages, they can also feel pain and kill each other in the game (which results in them getting the injection) but there are also plenty of prehistoric creatures hunting them down. The show and it's host are hugely popular with the masses who like nothing more then to watch murderers and rapists get devoured by velociraptors but the games have their fair share of protesters who try their hardest to sabotage the show. Amongst the contestants are a teenage psychopath, a gang leader, a teacher that bombed his own school and a cannibal with our main protagonist being Anthony Tucker (Adam Hampton) accused and sentenced to death for killing his wife yet he protests his innocence and, like the others, volunteers for the show to regain his freedom. Going by the title you would not be wrong in thinking this sounds very much like it could be a mash up between THE HUNGER GAMES and JURASSIC PARK and you would be quite right, that is pretty much exactly what it is with a bit of BATTLE ROYALE thrown in for good measure but do not think this is a bad thing because it is rather a lot of fun. The visual FX on the dinosaurs are really good and there are plenty of them. I find that movies with these kind of titles don't tend to feature the beasts they boast about as much as you would hope. No fear of that with JURASSIC GAMES as we are treated to multiple dinosaur species plus a few other prehistoric flora and fauna. The cast are all fairly capable with The Host (Ryan Merriman), cold blooded producer Savannah (Perrey Reeves) and the cannibal Albert (Luke Wyckoff) being stand outs for me. Adam Hampton as Tucker is fine as the "average man wrongly accused turns into reluctant hero" type and both he and actress Katie Burgess, who plays Joy, have acted in director Ryan Bellgardts previous movie GREMLIN. With a couple of unpredictable twists as you go along it holds your attention well. For its budget the visuals hold up, the soundtrack and setting sit right. It's not exactly original but it doesn't pretend to be, it's a fun movie that is worth checking out! A Triceratops as it grazing on my lawn would keep it pretty trim and as a bonus it would make quite a mean guard dog. A stegasaurus - I just always liked the way (we think) the looked. A T-Rex as I can pronounce and spell! A diplodocus as I've always wanted one since I was a little girl, either that or a spinosaurus as they're awesome. t-rex - seems slightly less scary than the others! T Rex, because that strong bite is all it takes.